…or Lucky Chip @ Giant Robot, but that makes it all sound a bit official. I’ve been to Giant Robot a number of times – it helps that it’s kind-of, sort-of near my office. I’ve recommended it to friends as a reliable place for great drinks and good food in a place that has a bit of an identity but without being overly hipster or uppity. So I got really, really excited when taking a few friends there the other week and finding that Lucky Chip burgers were featuring on the menu. I’ve not had the pleasure of the full Lucky Chip experience – London’s best burgers, according to some – so was very excited to have the option of doing so with the added bonus of warmth and shelter. And I was really, really disappointed. The “demi-brioche” bun didn’t taste particularly demi-brioche and didn’t have the healthy glow of the slightly steamed burger at Meat Liquor. The rest of it (aside from the patty – more on that story later) was fine, but it’s less hard to go wrong with lettuce, TK, mustard and tomato. But then there was some uninvited mayonaise – harrumph. 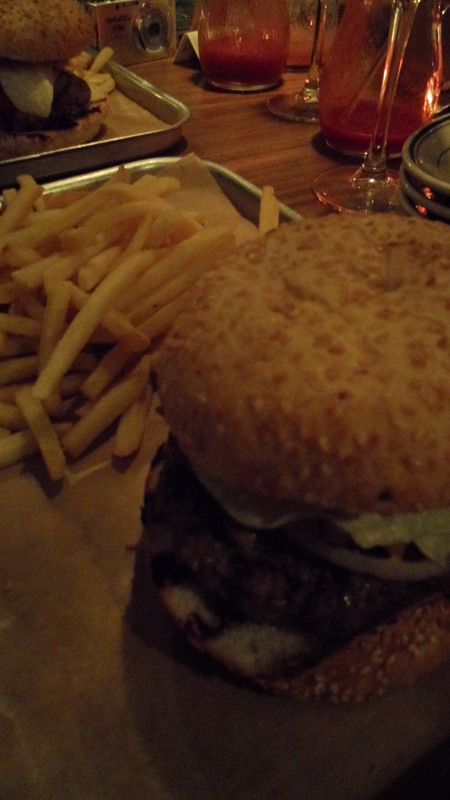 All of the above I could have dealt with if I’d been confronted with a smoky, juicy, dripping medium patty. But it was well-done. And it was dry. And it was quite bland. Under any other circumstances it would have been fine, but unfortunately I’d been asking it to live up to the brand name on the menu. This is why they say don’t meet your heroes – like the time the fifteen-year-old me kissed Pete Doherty and discovered the worst teeth since Jacobean times. I know this burger isn’t an accurate reflection of Lucky Chip deliciousness – which feels damaging to the brand (wearing marketer hat). If you’re proud of what you make, run a mile if someone’s going to faff it up. The rest of the meal was fine – nice meatballs, great cocktails. However, the 15% service charge tacked on the end of the bill felt pretty unacceptable when getting the attention of our waitress would basically involve a public order violation. But that’s a rant for another day.